A No 79 Squadron Hawk 127 performs an aerial display over the Clipsal 500 Adelaide racetrack. Cubic Global Defense (CGD) has delivered more than 60 P5 Combat Training Systems (CTS/TCTS) with air combat maneuvering instrumentation (ACMI) pods for the upgrade of the Royal Australian Air Force’s (RAAF) Hawk 127 fleet. As part of the Lead-In Fighter Capability Assurance Program (LIFCAP), Cubic’s P5CTS and ACMI offers enhanced air combat training capabilities, including live monitor functionalities and debriefing stations for the Hawk 127 Lead-In Fighter. LIFCAP achieved initial operating capability earlier this month. 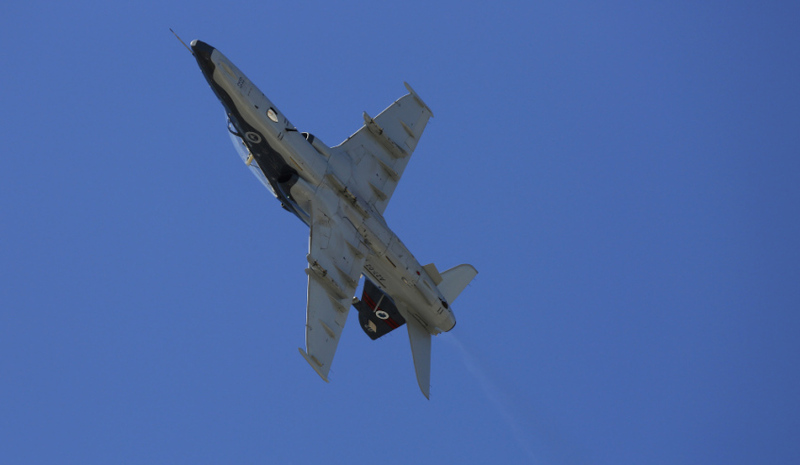 CGD’s P5CTS and ACMI were also provided for the F/A-18F/G Super Hornet and Growler, F/A-18A Hornet and the flight test community of the Air Warfare Centre. CGD’s P5CTS provides real-time and post-mission training for air-to-air, air-to-ground and surface-to-air combat missions by displaying the live-air picture, recording mission data and relaying time, space and positioning information between participating aircraft during training sorties. Key components of the system include GPS-enabled, aircraft-mounted airborne instrumentation “pods” plus ground stations, which help aircrew conduct, monitor and manage air combat training and post-flight debriefing. General manager of CGD Australia Miles Macdonald said the solutions offer new capabilities to the Hawk fleet. "We are proud to provide the Royal Australian Air Force with our industry-leading air combat training solutions for the upgrade of its Hawk aircraft," Macdonald said. "Our solutions enable RAAF Hawk aircrew to electronically review air combat training missions with fidelity not previously seen in the Hawk fleet. Additionally, squadron mission supervisors now have the ability to observe aircraft during flight using the live monitor functionality, plus manage the mission and flight environment to improve training performance." Wing Commander Carlos ‘Fonz’ Almenara, 78 Wing Executive Officer for the Hawk 127, praised the new capabilities CGD has provided the Hawk fleet. "Cubic’s P5CTS and ACMI offer fantastic capabilities for the Hawk and provides us with the ability to maximise our mission outcomes and minimise our need for re-training," said WGCDR Almenara. "It is not only a highly effective debriefing tool, but it enables us to provide enhanced training capabilities for the whole Australian Defence Force."